Nuclear power plants use or produce hydrogen isotopes deuterium and tritium. Deuterium is used in heavy water moderated fission reactors, usually as liquid D2O, to slow neutrons without high neutron absorption of ordinary hydrogen. This is a common commercial use for larger amounts of deuterium. Tritium is produced in nuclear reactors by neutron activation and it often needs to be removed from hydrogen gas lines, etc. 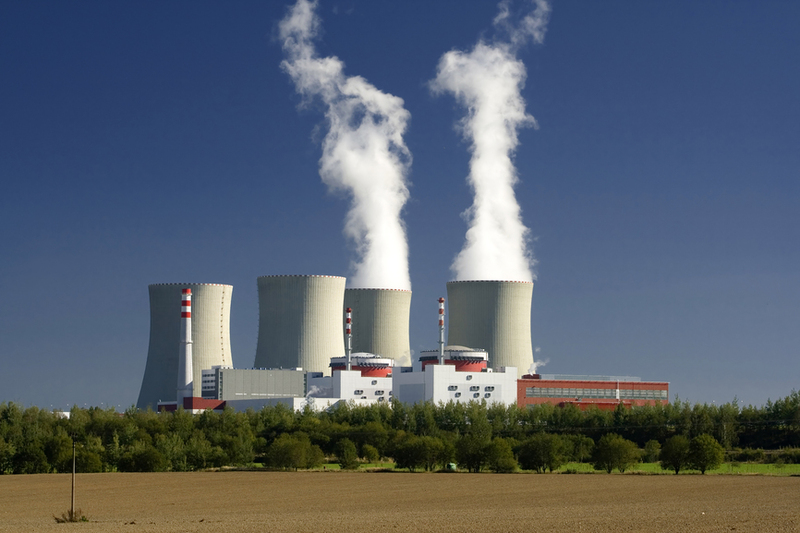 Tritium separation at nuclear plants is made simpler through the use of P+E’s hydrogen separators which allow hydrogen and its isotopes to be separated from other gases in a mixed stream. Power+Energy designs custom hydrogen separators to meet the particular specifications of its customer applications. With over twenty years of experience in hydrogen purification technologies, P+E is your best choice for challenging hydrogen isotope separation projects. Each hydrogen or hydrogen isotope purifier is engineered to meet usage requirements, efficiency demands and operating conditions. Our design is robust and will last through years of operation without failure. 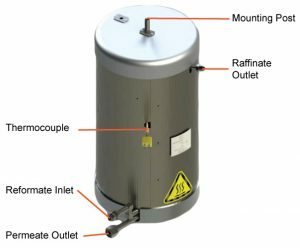 Each assembly includes our patented, Micro-Channel™ palladium alloy diffusion cell, gas pre-heaters, thermocouple(s), heat exchangers, insulation and proper connections. Power+Energy’s hydrogen separation products use patented Palladium Alloy Micro-Channel™ Technology. At elevated temperatures and positive pressures, Palladium (Pd) metal permits the diffusion hydrogen and hydrogen isotopes, but not other gases. In P+E’s micro-channel hydrogen separator, a low-purity hydrogen feed gas is fed into a system containing a Micro Channel™ membrane assembly. The gas stream moves along Pd alloy tubes. 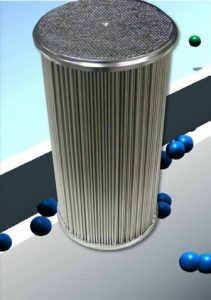 When the molecular hydrogen comes into contact with the tubes’ outer walls, it dissociates into atomic hydrogen and is absorbed into the metal’s lattice structure. While diffusing through the membrane walls, individual hydrogen atoms share their electrons with the host palladium. The hydrogen atoms recombine on the other side of the low pressure side of the wall and are desorbed as a hydrogen molecule. The resulting ultra-pure hydrogen has a purity level of 99.999999999%. As a hydrogen isotope separator, it may be mounted with large-diameter straight piping, using conflates on a low impedence valve (optional), directly to a turbo pump. The distance between the Pd-based membranes and the turbo pump can be less than 30 cm, helping to achieve maximum isotope recovery for any operating conditions.